For a majority of people, the main concerns in using the two facilities are faulty planning in terms of location, lack of cleanliness and maintenance, absence of lift/escalator and lack of security. Commuters in the capital prefer using subways over foot overbridges (FOBs) to cross busy roads, a survey commissioned by the Delhi government’s Planning Department has revealed. The survey was commissioned after ground reports showed that in many cases, FOBs and subways were under-utilised. “Subways appear to be a better option from the utilisation point of view. They relatively attract more users than FOBs. Therefore, it is recommended to build more subways for crossing roads,” the report said. It also quoted the ratio of users to non-users with whom they interacted, and found this ratio was better for subways. “The difference in this ratio is important for several reasons. For example, less effort is required in negotiating the total distance covered by subways, as compared to FOBs — both in terms of height and distance. There is a psychological advantage with subways as people have to go down first and then go up. 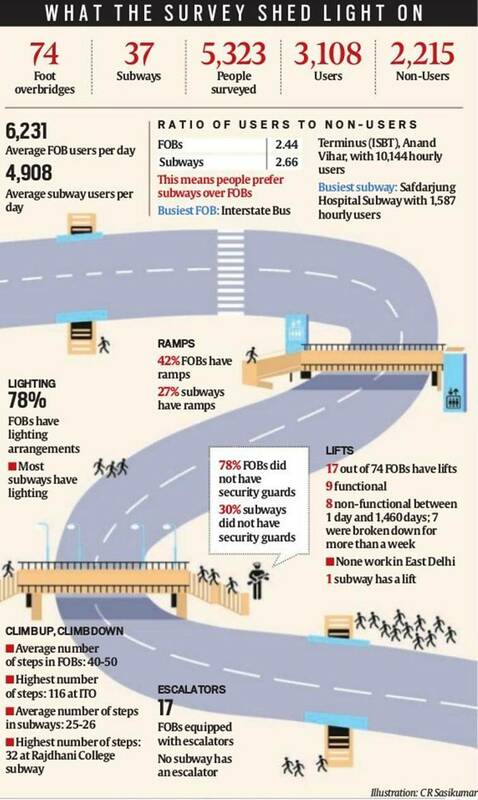 The number of steps in stairs are also less in subways, compared to FOBs,” the report said. While inaugurating the ITO skywalk in October last year, Delhi L-G Anil Baijal had said the city needs to plan better for its pedestrians. “The city has been very cruel to pedestrians. It is easier for motorists to go on a higher plateau-like structure than for an individual to go up, even if they use elevators. These things should be taken into account,” he had said. Senior government officials said the report and its findings were sent to departments such as the PWD and civic bodies for implementation of suggestions.